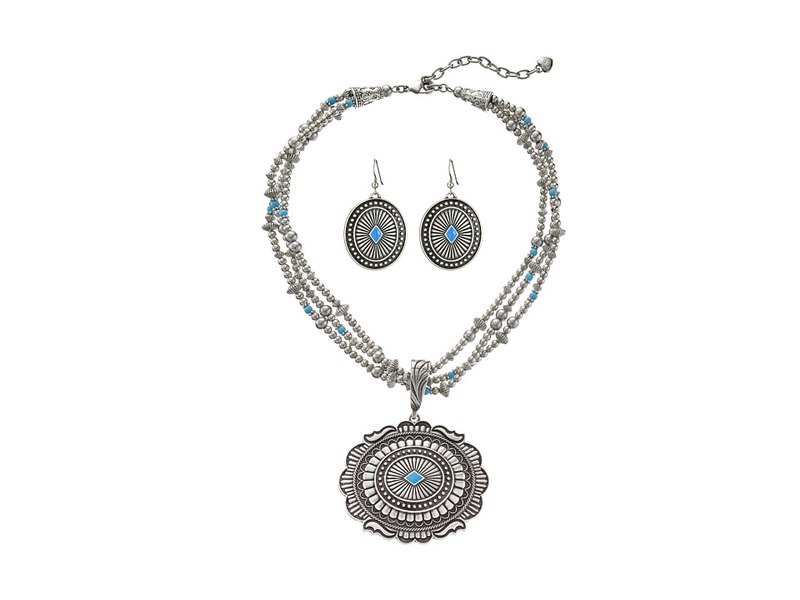 You will love the classic Southwestern look of the Triple Strand Oval Concho Necklace/Earrings from MF Western! Necklace: Triple strand necklace with silver-tone and turquoise beads. 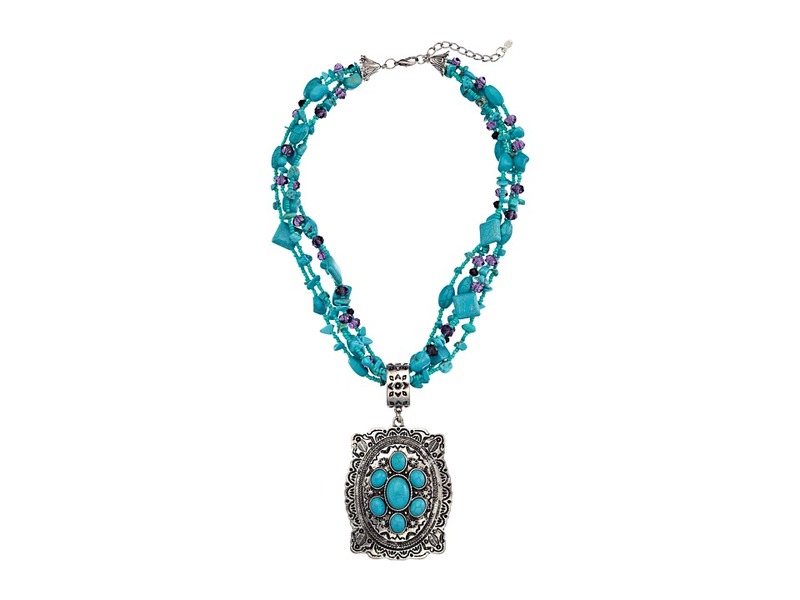 Features a large engraved silver-tone concho pendant with center turquoise stone. Lobster clasp closure. Imported. &amp#8226 Necklace length: 17 in (with 3 in extender) &amp#8226 Pendant: 3.3 in H x 2.7 in W Earrings: Silver-tone concho earrings with center turquoise stone. Hook backing. &amp#8226 1.5 in H X 1.2 in W Imported. 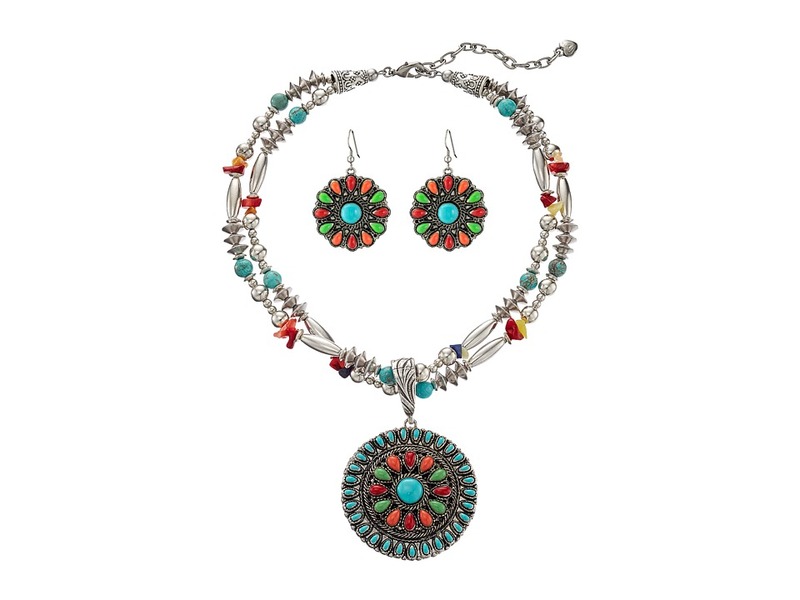 You will love the eye-catching look of the Multi Stone Concho Necklace/Earrings Set from MF Western! Necklace: Silver-tone necklace with beautiful multicolored stone accents. Features a large engraved concho pendant with multicolored stone accents. Lobster clasp closure. &amp#8226 Necklace length: 16.5 in (with 2.75 in extender) &amp#8226 Pendant: 3.25 in H x 2.2 in W &amp#8226 Weight: 2.6 oz Earrings: Includes two earrings. Silver-tone tooled concho earrings with multicolored stone accents. Hook backing. &amp#8226 1.4 in H X 1.25 in W &amp#8226 Weight: 0.4 oz Imported. 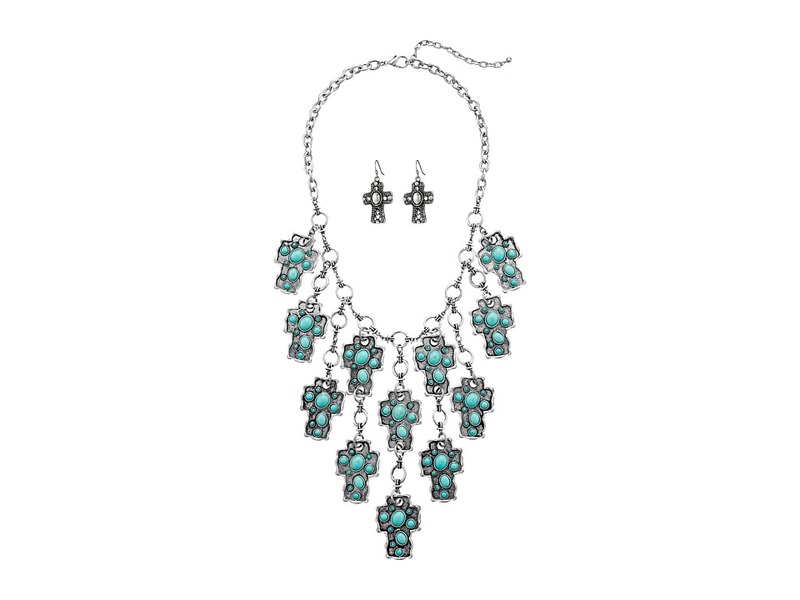 Complete your look with the MF Western Stone Cross Bib Necklace/Earrings Set! Necklace: Single silver-tone chain necklace features hammered silver-tone crosses with turquoise stones. Measurements: Length: 20 Pendant height: 5 Pendant width: 8 Earrings: Comes with two earrings. Silver-tone cross-shaped earring. Metal hook backing. Imported. The Feather Charms Necklace/Earrings Set from MF Western will easily woo you with its chic Southwestern style. Necklace: Silver-tone metal chain and braided leather necklace. 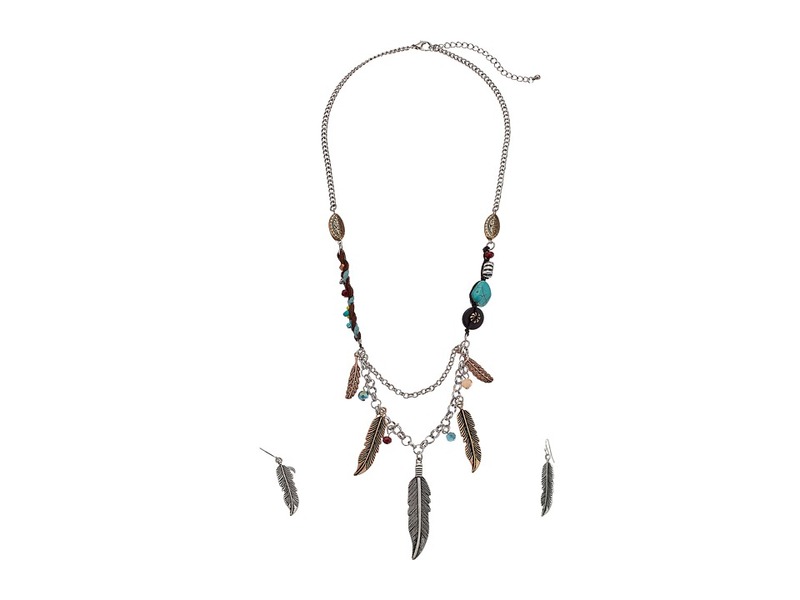 Features with turquoise stones, metal beads, engraved metal charms, and both silver-tone and brass-tone feather pendants. Silver-tone lobster claw closure. &amp#8226 Circumference: 23 in. &amp#8226 Extended Length: 3 in. &amp#8226 Pendant Height: 5.5 in. &amp#8226 Pendant Width: 4.5 in. &amp#8226 Weight: 1.2 oz. Earrings: Silver-tone arrow earring Hook backing. &amp#8226 Height: 1.0 in. &amp#8226 Weight: 0.2 oz. Imported. 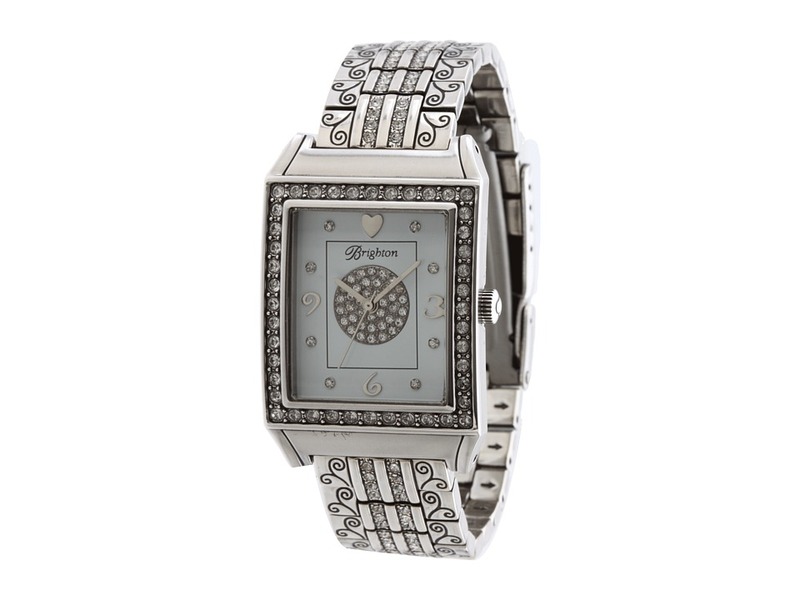 Part of the Stephen Webster&amp#174 England Made Me collection. Keep your fashion clean-shaven and captivating with the bladed brilliance of the Switch Blade Silver Pendant. White rhodium-plated box belcher chain necklace. White rhodium-plated pendant. Black mother of pearl inlay. 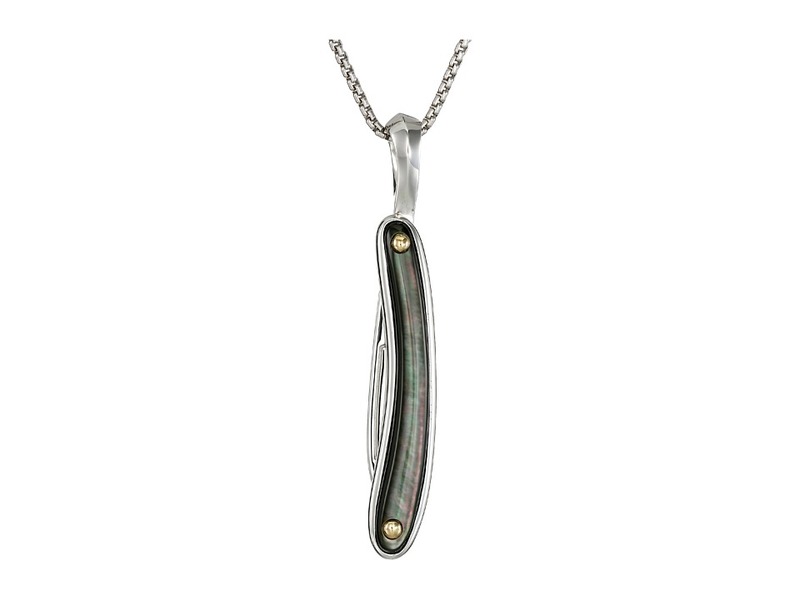 Mother of pearl stone totals 4.32 ct. Lobster-clasp closure. Imported. A hint of glamor sets off the evening in this wispy white gold and sapphire ring. 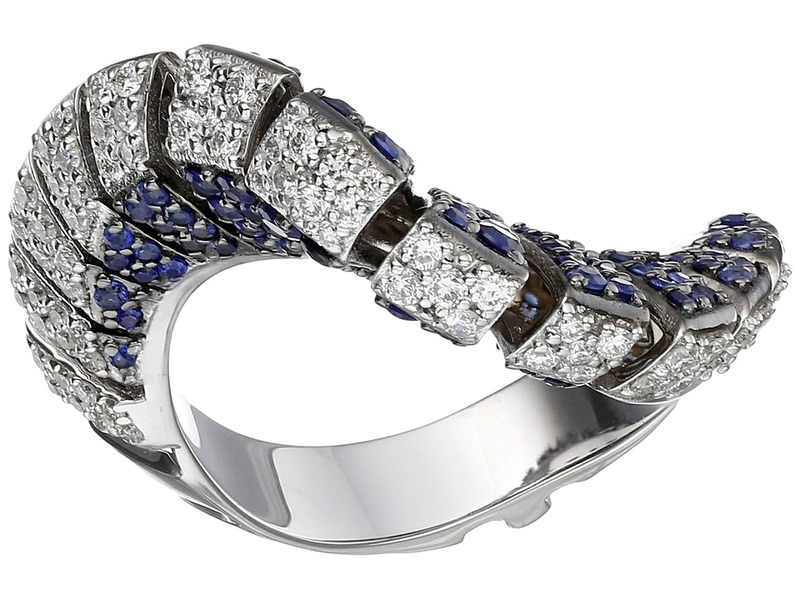 Diamond and sapphire in a wavy, infinity design. 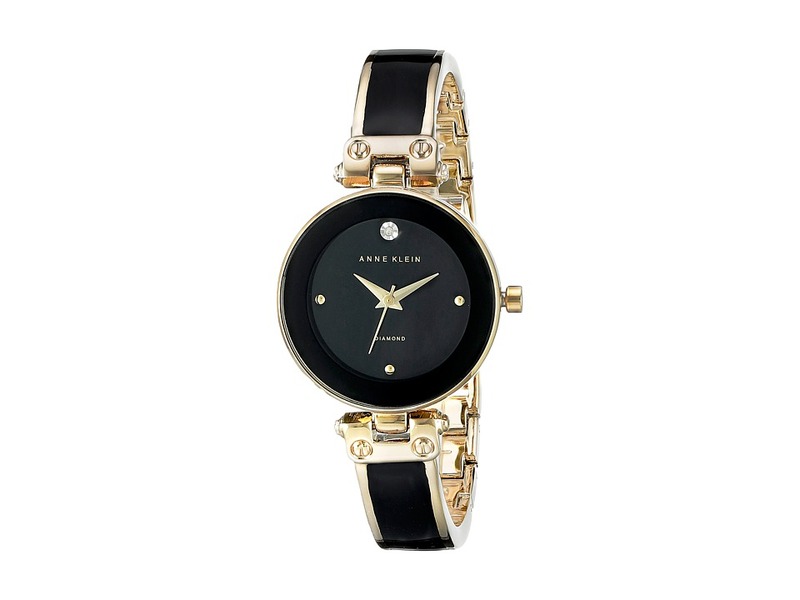 18 karat white gold. Sized. Made in Italy. This item may ship with an attached security tag. Merchandise returned without the original security tag attached or a damaged tag may not qualify for a refund. Measurements: Face Height : 2 5 in Face Width : 1 in Face Length : 3 10 in Weight: 0.1 oz Product measurements were taken using size 7. Please note that measurements may vary by size.